When Whitman Met Wilde….. | Books Now! 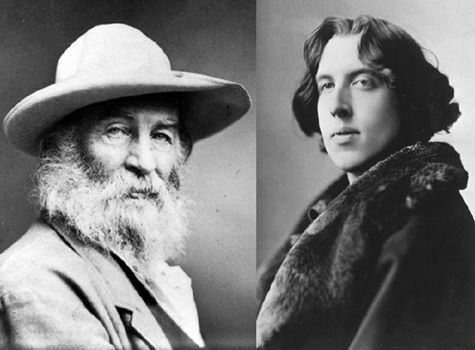 Oscar Wilde and Walt Whitman once spent an afternoon together. They drank elderberry wine and talked about being famous. From The New Republic. Thus Walt Whitman described the day he spent with Oscar Wilde. This meeting between the self-described “old rough” who revolutionized American poetry with his masterpiece Leaves of Grass and the self-anointed “Professor of Aesthetics” who was touring America with a lecture praising sconces and embroidered pillows, has been examined often in the intervening years, usually through the lens of what is now called queer history, or as an interesting, if not particularly consequential, moment in the history of literature. But neither approach takes the true measure of the meeting’s importance. For Wilde didn’t travel to Camden to talk about gender roles or belles lettres. The writer was still years away from becoming the author whose peerlessly witty plays are still staged today. What drew him to Whitman’s home was the opportunity to discuss fame. He wanted to listen to the singer of “Song of Myself”—an older man (Whitman was 62, Wilde 27) with inexhaustible energy, despite his infirmity, for self-promotion. Whitman was an international icon who exploited the fuzzy line between acclaim and notoriety and a media-savvy poet who understood the crucial role of image in the making of a literary career. Wilde didn’t travel to Camden to learn how to be a famous writer. That, he was certain, he would later teach himself. He went to learn how to be a famous person. It would be hard to imagine a more apt pairing of teacher and student. “The most beautiful things in the world are the most useless: peacocks and lilies, for instance,” the Oxford professor John Ruskin had written. To W.S. Gilbert, however, the movement was a nirvana for useless narcissists and a way for self-adoring dandies to natter away in public about their exquisite taste, a conviction he verbalized to great comic effect in Patience. The principal male roles in the operetta, Bunthorne and Grosvenor, two poets competing for the hand of a lass named Patience, were composites modeled on several leading aesthetes, among them: the painters Dante Gabriel Rossetti and James McNeill Whistler, the poet Algernon Swinburne, and the recent Oxford graduate Oscar Wilde—who claimed, with no justification, to be the leader of the movement. Wilde had just self-published his first book of poetry to some withering reviews, sarcastic cartoons in humor magazines such as Punch, and negligible sales. What had made Carte nervous was that the aesthete was not a native species in the United States. Would American audiences get the jokes? A solution was put forth by the manager of Carte’s New York office: send over a “real” aesthete (maybe Oscar Wilde?) and have him present a series of lectures in America (“On Beauty,” perhaps? ), delivered in the same “aesthetic” costume (satin breeches, shiny patent-leather pumps, form-fitting velvet jacket, and so on), worn by Bunthorne in Patience. A telegram was sent from New York to Wilde in London that claimed (falsely) that fifty American lecture agents were ready to book him, if he were available to speak. Wilde was nearly broke, so he answered, “Yes, if offer good.” It was: fifty percent of the box-office take, less expenses. Past winners included Matthew Arnold and John Ruskin. “I come as a poet to call upon a poet,” Wilde said, when Whitman opened his door. Whitman, who adored being adored as few others ever have, was delighted to hear this. He went to the cupboard and removed a bottle of his sister-in-law Louisa’s homemade elderberry wine. The two men began to empty it. They were unlikely drinking companions. Wilde had a double “first” from one of the most prestigious universities in the world; Whitman left school at age eleven. Wilde was a polished talker and epigrammist; Whitman spoke in short, occasionally ungrammatical bursts. Wilde was a snob; Whitman (in his own words) “talk[ed] readily with niggers.” Despite these differences, the two men enjoyed each other’s company. “I will call you Oscar,” Whitman said. “I like that so much,” Wilde replied. He was thrilled to be in such close proximity to the man who, as Wilde had hoped to do for himself, had launched his career with a self-published book of poems. So Wilde accepted Whitman’s invitation to accompany him to his den on the third floor, where, as Whitman said, they could be on “thee and thou terms.” Wilde was shocked by the tiny room where Whitman wrote his verse. Dust was everywhere, and the only place for Wilde to sit, a low stool near Whitman’s desk, was covered by a messy pile of newspapers Whitman had saved because he was mentioned in them. The portrait Whitman gave Wilde in 1882 appeared on his next book, Specimen Days & Collect, an assemblage of travel diaries, nature writing, and Civil War reminiscences. (Whitman had spent the war years in Washington, working as a government clerk and volunteering as a hospital visitor.) He is in profile in the photograph, sitting in a wicker chair wearing a wide-brimmed hat, an open-necked shirt, and a cardigan. A butterfly is perched on his index finger, held in front of his face. “I’ve always had the knack of attracting birds and butterflies,” Whitman once told a friend. Years later Whitman’s “butterfly” was found in the Library of Congress. It was made of cardboard; it had been tied to his finger with string. By handing Wilde that photo Whitman was teaching him that fame as a writer is only partly about literature. It is also about committing oneself to a performance. Such role-playing isn’t the act of a phony; in Whitman’s mind every pose he struck was authentic. This type of authenticity—the fashioning of an image one would be faithful to in public—Wilde had experienced on a small scale playing the aesthete on the campus of Oxford’s Magdalen College and at parties in London. It was instructive to have its truth verified by a literary star who had proved its efficacy on an international scale. Wilde had always believed there was nothing inglorious about seeking glory. By handing Wilde his portrait, Whitman was confirming that instinct. Tags: American poetry, British literature, Oscar Wilde, The New Republic, Walt Whitman | Permalink. Endearing close-up of crafty poets 🙂 like the cardboard butterfly tied to Whitman’s finger with string. Absolutely fascinating (even though I am in catch-up time I read every word). What an unlikely pair and how interesting that the media juggernaut has really changed so little.